This photograph is a first for this website in two ways: firstly it is the first time I have posted a photograph not by myself, and secondly, it is the only personal photograph I have ever posted on here. 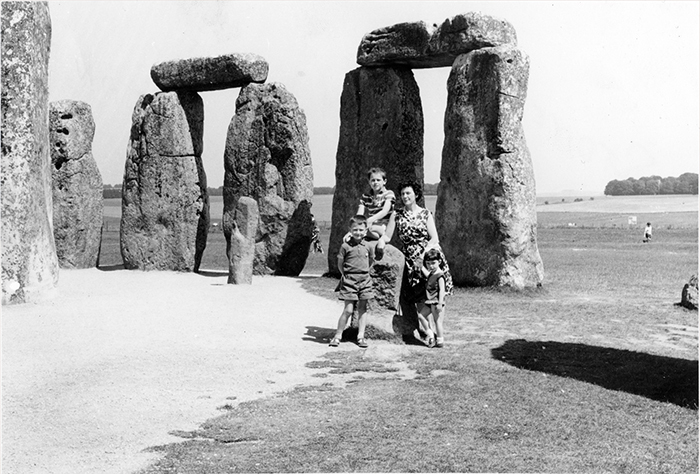 The reason for it is this: English Heritage are celebrating 100 years since Stonehenge passed into public ownership, and as part of that they are inviting everyone who cares to to post on their website photographs of their visits to Stonehenge, however old those photographs may be. Their timeline dates from 1850 to date - in short, from the birth of photography. This is my contribution. It is probably from 1967 and shows, from bottom left, clockwise: my brother Mike, me, mum and my sister Jan. Dad was behind the camera. He wasn't a bad photographer, was he? I seem to recall he was using a Ricoh rangefinder camera in those days. Looking back, it seemed a devilishly complicated beast of a thing, but it did have a rather elegant brown leather case. This was from a family holiday which comprised one week in Weston-super-Mare and one on the Isle of Wight. I dare say this was on the journey between the two locations. In adult life I have lived in various bits of the South and South West, so these places are now quite familiar and banal, but how exotic and distant (from our little corner of Greater Manchester) they seemed back then, and how gruelling the travelling was in our rusted-out, probably lethal Ford Zephyr in those pre-motorway days. So, anyway, I guess it is not for me to invite you to post your Stonehenge pics on the English Heritage site, but maybe this post will prompt you check it out. Look for Stonehenge100.